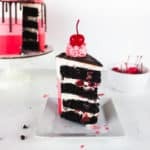 This Ben and Jerry’s inspired cake has 4 layers of dark chocolate cake, a sweet cherry compote filling and rich vanilla buttercream frosting. Wrapped in an ombre frosting and topped with a dark chocolate ganache, this sweet treat is sure to delight! To make the cake, pour the boiling water over the semi sweet chocolate, and whisk until smooth. In the bowl of a stand mixer, whip the egg until light and frothy. Add the vegetable oil and continue whipping until completely incorporated. Add the sugar, buttermilk, vanilla extract and water/chocolate mixtures, and whisk until just combined. Gently whisk in the baking cocoa, flour, and baking soda with a spatula until the batter is lump free. Divide the came batter evenly between two 6″ cake pans (about 1lb of batter each), and bake for 30-35 minutes, or until a toothpick inserted into the center of the cakes comes out clean. Once the pans are cool enough to handle, transfer the cakes to plastic wrap, and refrigerate until cool and firm. While the cakes bake and cool, heat the heavy cream and chocolate for the ganache in the microwave until hot (about 30 seconds). Gently stir with a spatula (a whisk will create too many air bubbles) until smooth. Set aside to cool (about 30 minutes to an hour). To make the frosting, stir together the water and granulated sugar in a small saucepan over medium-high heat. Bring to a boil and continue boiling until completely clear. While the syrup cooks, whip the egg whites in a stand mixer until stiff. With the mixer on low, slowly pour the hot syrup into the egg whites. Increase the speed to high and whip until the mixture and bowl cool to room temperature. With the mixer on low again, add pieces of butter until all the butter has been added. Add the vanilla extract. Increase the speed to high and whip until a smooth frosting forms. Once the cakes are cool, level the tops if necessary and split each cake in two. Begin stacking your layers of cake, alternating between layers of cake, cherry compote and frosting. Coat the top and sides of the cake with a thin layer of frosting (a crumb coat) and allow to set in the refrigerator (about 15 minutes, or until the frosting is firm). Frost the top and top third of the sides of the cake with a generous helping of frosting. Divide the remaining frosting between two bowls and tint two shades of red/pink. Fill a piping bag with each color. Starting with the lightest of the two reds, pipe around the middle third of the cake. Pipe around the bottom third of the cake with the darkest red. Use an offset spatula or bench scraper to smooth the sides. Allow to set in the refrigerator until the frosting is firm (about 15-20 minutes). Garnish the cake with leftover frosting and maraschino cherries.